So in the spirit of FULL transparency this is just a recipe that I ripped from the brilliant ladies at Trim Healthy Mama, with a few modifications of my own that make it less geared towards weight loss and more geared for immunity in the winter months. The health benefits of oolong have long been document and are no secret, but sometimes I think the earthier taste puts people off. These last few months I’ve transitioned to drinking tea to get me through the afternoon slump, and this latte recipe is PERFECT. With a list of health benefits like that I obviously had to get on board. Let me know if you make it! First boil water and steep tea for a good long while. I usually let mine sit for 15-20 mins to make sure it’s strong since it will get diluted with the milk. While that’s happening, heat up the milk. Over the stove is best, but if I’m honest sometimes I just put it in the microwave. Pour into a blender along with all the other ingredients and blend for a 30 seconds or until frothy. Then pour and serve! Hope you all enjoy and stay warm and healthy as it gets cold! So I had heard whispers about it, but nothing really prepares you for the utter trauma of going from that pregnancy glow to life after giving birth. (Insert eye-roll, death face, sobbing emojis.) One day your skin has never looked better, your hair is full and glossy and thick, and the next your jawline is covered in spots and your hair is falling out in handfuls. "Congratulations, you made a human, here's some acne." Not eager to revisit Gabby-circa-2004, I quickly started researching what to do. 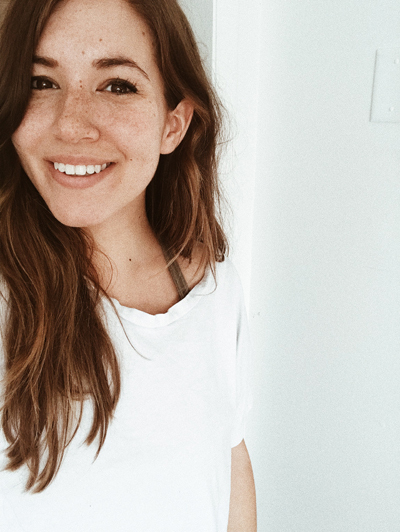 While it's still a process, I've managed to start transforming my skin literally overnight which is why I wanted to share what's been working for me with all of you. The thing is, I didn't actually find much in terms of advice. Generally, the mommy forums and baby blogs just shrugged their shoulders and said "Wash your face, and ride it out." So I set out on my own (and little help from my friends on Instagram) to figure it out. Before going any further I just want to say I'm not an expert, I did not consult with any dermatologists, nor am I sponsored or paid by any of the companies I list below. These are just some of the products I've been using that have transformed my skin and I wanted to share. First things first. What you eat matters. We're learning more and more about how food has the power to heal and help prevent so much of what goes on with our bodies. So I first looked to what I was eating and drinking, and came up with this matcha latte recipe that I drink daily. I love coffee but it tends to dehydrate you, so I traded out my afternoon mug for this latte which has less caffeine and is full of beauty benefits! 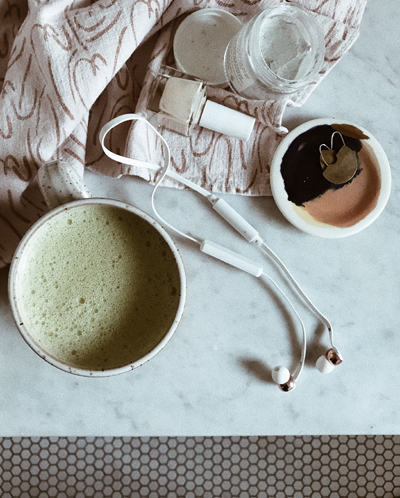 Matcha is FULL of antioxidants, chlorophyll (so good for skin!) and fiber. It also helps focus and calm your mind which means it's perfect for my afternoon slump. Collagen peptides. I started mixing these into my morning cup of coffee two years ago when my nails were brittle from the lack of nutrition that sometimes comes with living on the road when you don't get to pick what you're getting fed everyday. But the first benefit I noticed wasn't actually in my nails but in my skin-- it was clear, lush and healthy. I haven't stopped taking it since. I would highly recommend reading about all the benefits of collagen if you've never have. It always amazes me when food contains such power. It's such a reminder that we've been provided for and given so many gifts in this world of ours. I had never used any Juice Beauty products before but wanted something that was natural and would be gentle on my skin. I picked this up at Whole Foods and it's been working wonders. Best results when you wash your face in the morning and the evening, and full confession: most nights I'm so exhausted from the day I tend to crash land in my bed and forget to wash. I know. It's horrible. But it's what having a newborn will do to you! Next I spray on a toning mist, and I ADORE this one from Leahlani. It's fresh, smells like heaven and is so good for your skin. This mist includes chamomile, aloe and lavender to help reduce inflammation, so angry acne gets soothed away. I had been using this stuff during my pregnancy and found it helped my face not feel so puffy. Turns out I still need all the help I can get in that department! More matcha! 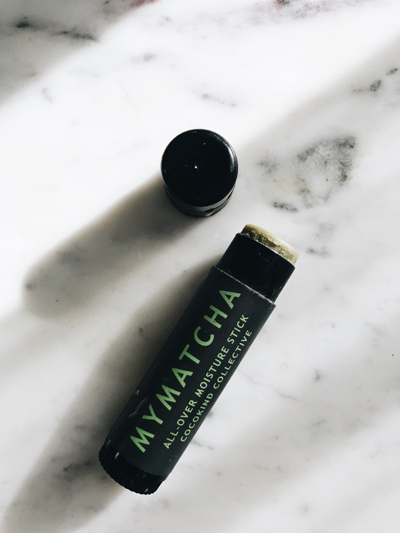 So I don't use this for my acne specifically, but I have been using MyMatcha from cocokind stick for about a year now in the areas of my face that need a little extra moisture. It's a bit heavy (but contains just THREE organic ingredients: coconut oil, beeswax and matcha powder!) so I apply it under my eyes and around my lips when I tend to get a bit dry. I'm including this product because it's a part of my everyday skincare routine and I'm obsessed. The other oil I've been applying is tea tree essential oil from Young Living directly on my acne. It works better than any drug store spot-killer I've ever used. Literally worked overnight. However, you have to be careful when using it because it can really dry your skin out fast, which is why it's good to have hydrating mists and other facial oils to maintain an overall healthy moisture.